This Mechs vs. Minions review was made after playing through the first six missions. What is Mechs vs. Minions? 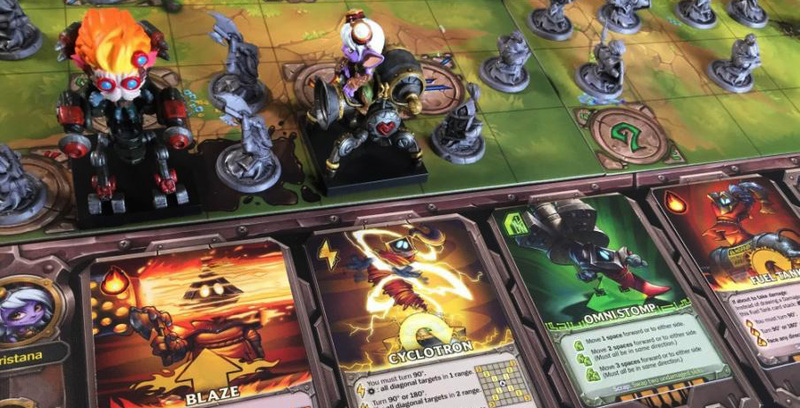 Mechs vs. Minions is a cooperative programming game in which you and your fellow teammates will be mechs trying to hold off a hoard of minions. The game is set in the League of Legends universe, but it is not a board game version of the video game. There are 10 missions in Mechs vs. Minions, but here we are just going to go over the basic rules. These rules can be changed a bit depending on which mission you’re playing. You might look at the glorious contents in the box and think that this is a very complicated game, but it’s really not. You’re simply programming in what you will do each turn and then executing those actions. Each turn, you will be drafting cards and moving them onto one of the six spaces on your “command line” board. These cards will let you move, rotate, and/or fight. What’s really cool about this is that you can stack like-cards to upgrade your powers. After all of the players/mechs have taken their turns, the minions will take their turns. The mission book will tell you how far and in what direction the minions will move. The book will also tell you where new minions will spawn. The minions have different goals every turn; for example, in some missions the minions are simply trying to reach a location on the board before you are able to complete your objective. When minions deal damage to mechs, players have to draw from a damage deck. These cards can have one-time effects or they can stay on your command line until you remove them. Another cool part of this game is leveling up your mech by killing a certain number of minions. This will allow you to flip one of your upgrade cards, giving you a great new ability. Believe it or not, that’s all you need to know going into your first game. Mechs vs. Minions comes with a tutorial mission, so you should have no problem jumping right in. If you want to learn more about the game, take a look at the official Mechs vs. Minions rulebook (zip file). This is one of the most beautiful games that you will find. The rulebooks, the boards, the miniatures, and even the dice look fantastic. I’m pretty sure this is the best-looking cooperative game I’ve ever played. Drafting cards is both intense and very satisfying. You want everyone to get what they need, but often you need to decide which player needs the card more. It’s really great that you can stack cards when programming. You’ll never feel stuck with a card like you do when playing a lot of other programming games. I like that you’re pretty much always working on two things: the mission itself and making sure you program your mech correctly. It is definitely a unique and fun puzzle to try to solve. It’s also impressive how easy it is to learn how to play this game. The tutorial mission is great because it quickly teaches you how to use the cards and the default rules for dealing damage. Once we got through the tutorial, the missions were extremely easy to learn. Considering how much is going on in each game, it’s really surprising how quick it plays. Our longest game with four players was just over 90 minutes, which is a perfect length of time for this type of game. You can get really unlucky with the card draws in Mechs vs. Minions. Sometimes you’re just stuck with some undesirable cards and have to find a way to limit the damage. It doesn’t have much replayability. The boards aren’t set up randomly, so you can go into each mission with a predetermined strategy after your first playthrough. Simply put, Mechs vs. Minions is a fantastic board gaming experience. Everything looks great and the guys over at Riot Games found a way to make programming work very well in a cooperative game. It’s already in our top cooperative board games list, and it might even move up higher in the future. You definitely don’t have to be a fan of League of Legends to enjoy this one. Awesome game. 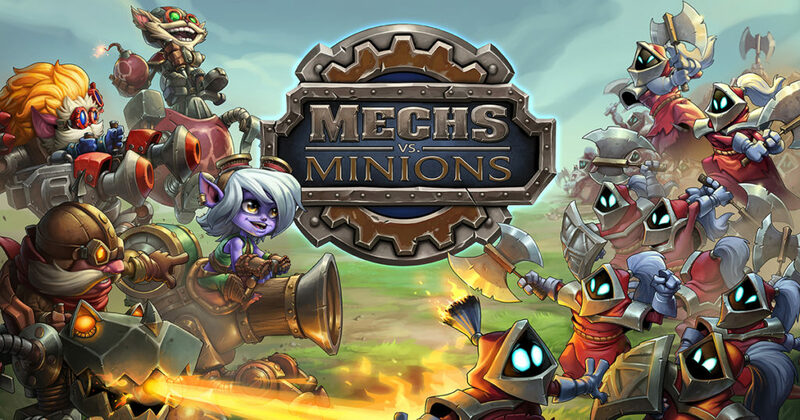 Thanks for taking the time to read our Mechs vs. Minions review! To stay updated on all things cooperative board games, follow us on Twitter, Facebook, or via RSS.